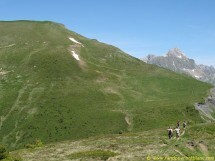 Hiking to the Great "Croise Baulet"
This Sunday, May 22 on the "Grand Croise Baulet". Since Megève on the walking tour of the Mont-Blanc and the balconies of the Arly. We start from the car park "Frasse" (1400 m). We reach the forest ridgeline between Christomet and the Eperon, and the top of the Salle. then pass the "Col du Jaillet", and by sustained back and jumps, you reach the Petit Croise Baulet. Climbing to the neck of the Avenaz (1929 m) and a section of the Mont Blanc Country Tour to the summit: the great Croise Baulet (2236 m). A beautiful path with a great view at the top. From Megève (75 km from Geneva), we walk on a panoramic summit. A circular hike. A gradient of 900 m and a distance of 12 km. Walking time: about 6 hours. People Attending Hiking to the Great "Croise Baulet"